North Korea’s ballistic missile tests are indeed a roller-coaster ride. After a string of failures in its recent ballistic missile testing program, with some missiles failing almost immediately after launch, last Sunday it conducted what some are calling its most successful ballistic missile test to date . The test provides a shot in the arm for Pyongyang’s WMD programs. It also signals to the broader international community that the North’s ballistic-missile capabilities are definitely improving. Yes, the missile flew to a range of 787 km —on the face of it, nothing startling. But over at 38North, John Schilling noted  that the test represents ‘a level of performance never before seen from a North Korean missile’ and suggested that the missile’s range is better seen as 4,500 km, not 800 km. He’s not making a wild guess. The test provides an excellent opportunity to remind readers of an important general rule about missile range. The rule can be found in a useful—and free—little publication called The physics of space security: a reference manual (which can be downloaded here ). In their chapter on space launches, the authors take the reader through what’s called the ‘½ rule’. Broadly, the rule states that if a missile is fired straight upwards into space, it will achieve an altitude of ½ its maximum range. A Scud missile with a maximum range of 300 km, for example, would—if fired straight up—reach an altitude of 150 km before falling back to earth. So the interesting statistic from the recent North Korean test is not the missile’s range but its altitude. That’s been reported  at 2111.5 km—a figure that, had it been achieved by firing the missile straight up, would point to a range of 4,223 km. That altitude was achieved while using some of the missile’s thrust to go almost 800 km downrange, which points to a range figure a little greater than that. Of course range also depends on payload, so perhaps it would be more accurate to say that the test missile might have flown to a range in excess of 4,223 km with that particular payload. North Korea has emphasised that the missile is capable of carrying a large, heavy warhead. From publicly-available sources, it’s hard to tell how large the actual payload was. Several analysts have pointed to the fact that this missile is not an ICBM. That’s true. An ICBM is defined in the strategic arms control agreements between the US and Russia as any ballistic missile with a range of, or above, 5,500 km. That range wouldn’t actually allow North Korea to target the continental US—or, at least, not the 48 contiguous states. But President Trump has said that North Korea will not be allowed to develop an ICBM, without providing any different definition of such a capability. Some commentary on Sunday’s test has observed that the North Koreans might well be testing ICBM ‘subsystems’ in their current program. 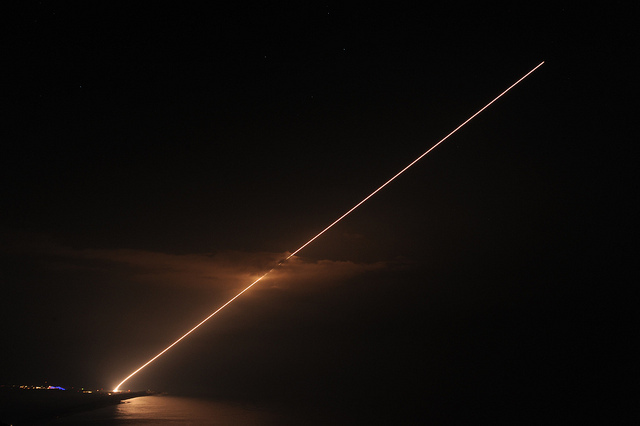 By flying the missile on a highly-lofted trajectory, for example, the North Koreans have been able to subject their re-entry vehicle to a more stressful heat test than could have been achieved by a standard trajectory. William Broad and David Sanger, writing in the New York Times, suggest that such gains show a Pyongyang tip-toeing over the line  that the US has attempted to draw in relation to ICBM-applicable technologies. As North Korea makes greater efforts to field an arsenal of longer-range missiles, we might begin to see a pattern of more frequent lofted missile tests. If so, that’s going to set Washington’s teeth on edge, not to mention Tokyo’s and Seoul’s. Australia itself has already been threatened with nuclear attack by North Korea, and the credibility of that threat can only grow as Pyongyang’s missile capabilities increase. If we’re witnessing the start of a new wave of longer-range missile tests, we might all soon be paying much greater attention to the ‘½ rule’. Pyongyang needs to be particularly careful about conducting a test where the missile reaches an altitude suggestive of a 5,500-km range. If that were to occur, the ‘½ rule’ might end up being a trigger for war. Rod Lyon is a senior fellow at ASPI. Image courtesy of Flickr user U.S. Missile Defense Agency.